If you're in New York City, join us May 29th from 7:30pm onward at Rudy's -- 9th Avenue between 44th & 45th Streets. For the first hour, first drink is on us. 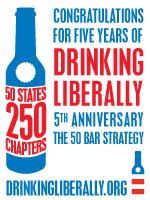 If you're anywhere else, join your local Drinking Liberally mailing list for info on nearby anniversary events.